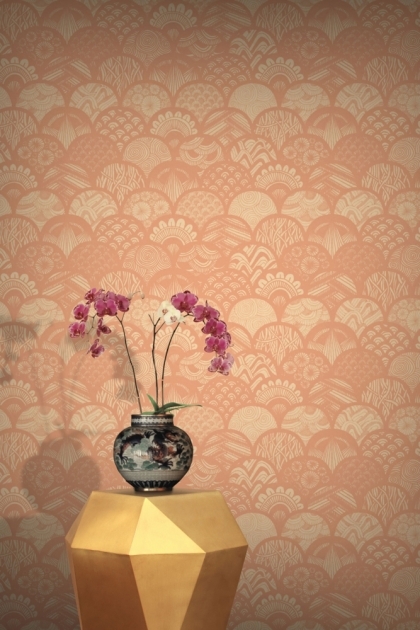 An intricately detailed contemporary wallpaper design, influenced by the Art Deco movement. This design marries soft, organic and aquatic patterns with hard edged, geometric, Art Deco elements. Combined with a scalloped arrangement and subtle colors, it becomes reminiscent of an ornately feathered bird. Material: Easy-to-hang 150g non-woven wallcovering. Hanging: Paste is applied directly to the wall. No soaking needed. Removing: Dry strippable (depending on wall substrate and processing). Inks: Digitally printed with the most environmentally friendly inks (UL ECOLOGO®, UL GREENGUARD GOLD Certified). Substrate: All fibres from sustainably managed forests. Free of glass fibers and PVC. Wallpaper rolls have a delivery lead time of 10-14 working days. Samples should be delivered within 3-5 working days.